﻿Published by Sareth Ney on March 29, 2017 at 5:40 p.m.
HOUSTON – Houston Whatever Fest will feature music, comedy and art in downtown Houston. The event is set to take place from April 1 through April 2. AWOLNation, Cold War Kids, Big Freedia, Ghostface Killah, Another Run, Robert Delong, The Sold Rebels, American Football, T2 The Ghetto Hippie, Doeman, Deftunes, Asher Roth, Faceplant, Tim Woods, Rizzoo Rizzoo, Mark Farina, Victo Wooten with Dennis Chambers, Lyric Michelle, Frog Hair, Guilla, Ill Faded, Walker Lukens, The Cops, Kiss Alike, To Whom It May, Sherita Perez, Wrestlers, Madsons, Great White Fire, Vodi, Seldom, Purapham, Roman G, Passerbye, Londale, The Contagious, Muddy Belle, Secret Sands, Noe Tha Chief, Cemetery Sun and TJ Tha Kid are the musical acts at Houston Whatever Fest. T.J. Miller, Ali Siddiq, Michael Winslow, Arielle Norman, Judah Friedlander, Avery Moore, Ashton Womack, The Gorburger oShowShow, Dave Ross, Emma Wilmann, Mark Hurtado, Cliff Cash, Warren Wright, Crystal Powell, Ray Connoly, Sam Demaris, Rob Mungle, Son Tran, Kristin Lindner, Barry Laminack, Tommy Drake, Owen Dunn, Scotty Peterson, Keith Ray, Mairéad Dickinson, Caroline Picard, Keith Ray and Bret Whitacre are the comedians performing at Houston Whatever Fest. Artists showcasing their work at Houston Whatever Fest are: Wayne Adam, Olay Allen, Jairo Almeida, David Anderson, James Armentor, Justin Baehr, William Beattie, Melissa Belanger, Theresa Bouley, Carlos Brandon, Jonski Brooks, Debi Cable, Colton Canava, Franky Cardona, Ganimedes Cervantes, Tony Collins, Samantha Colvin, Jennifer Corletto, Katherine Culbertson, Reggie Curtis, Michaelma Decuir, Luisa Renay Diaz, Michael Flores, Mary Foegelle, Adam Foret, Sergio Garcia, Diego Garza, Joshua Gray, Elizabeth Groll, Karina Guzman, Jaz Henry, Salvador Hernandez, Christopher Hernandez, Sarah Hill, James Hogsten, Alex Hundemer, Amy Izaguirre, Rebca Joffe, Ian Kristensen, Joseph Lakata, Alexander Le’Jo, Ricardo Lopez, Joseph Loving, Ryan Marin, Nina Marinick, Marlene Martinez, Louis Maytorena, Polina Moiseenko, Morgan Newton, Annavy Nguyen, Shelbi Nicole, Bret Nix, Nickol Ortiz, Richard Ortiz, Fabian Owens, Justin Pelke, Yuri Peña, Kay Peterson, Shyleta Pinkney, Wendy Pirolo, Angela Quesada, Maria Ramirez, Kerry Ramirez, Edward Reyes, Jason Rodriguez, Johnnie Rosales, Jr., Corey Scott, Robin Silvers, SKEEZ181, Kerrington Smith, Christopher Sotelo, Scott Tarbox, Erin Tarkington, Augustine Tellez, Kara Timmons, Jeremy Tolbert, Julie Trevino, Laina Twersky, Brian Wandtke and Jessica Warren. 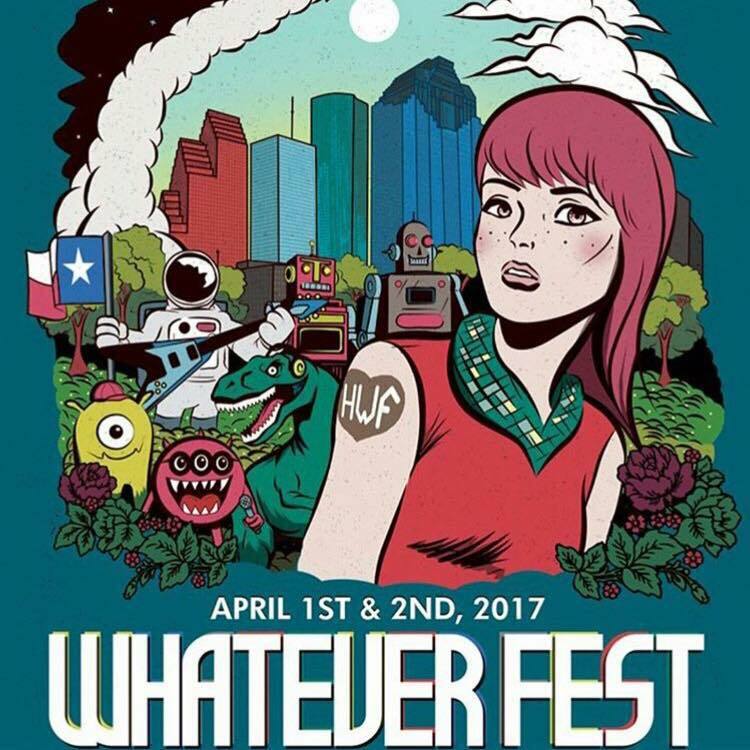 ​Tickets to attend Houston Whatever Fest start at $55. For the various ticket packages—including parking passes, please click here. Prices exclude fees. It will begin at 11:30 a.m. on April 1 and will conclude at 10:30 p.m. on April 2. For more information, click here.